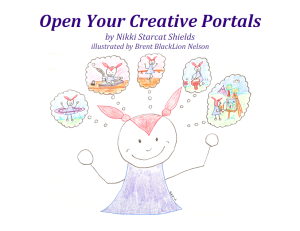 As I write this on a rainy Sunday afternoon, BlackLion and I have just put the finishing touches on Open Your Creative Portals. We’re working on making a “landing page” for it on my Starcat’s Corner website, so folks can sign up for my brand-new newsletter and claim the e-book as their free gift! Woo hoo! Here’s a peek at the cover; BlackLion did the adorable artwork. His images of Fay and her friends are sprinkled throughout the book. I love how it came out! And I’m very excited to share it with everyone, most likely starting tomorrow. Yippee!!! Let’s see, what else have I been up to? All my projects are simmering along nicely, it seems. I had a good response on my survey about daily spiritual practice (DSP), and I’m working on putting the data together in a spreadsheet so I can evaluate it and use it to write chapter 2. I added 815 new words to the DSP book on Friday, and I’m now at 11063 words, on the way to a target of about 50K (though it may end up being less; we’ll see). I wrote and sent a book review, and started reading another book that I’ll be reviewing. I also wrote a blog post for Starcat’s Corner yesterday. I received a big box of copies of my second book, Cultivating Self-Love: Your Path to Wholeness. After I posted about it on Facebook, I got a message from a local shop-owner. A friend had connected me with her this spring, and she is interested in carrying copies of both my books. We set up a date for a book-signing at her shop in September. So that’s another exciting piece of news! As I write this update, I’m starting to get goosebumps. I’ve been pouring so much joyful energy into my business and creative projects lately, and in this moment I’m realizing how much fruit it’s bearing. I feel overwhelmingly thankful and blessed! Work on the DSP e-book at least 5 days. Finish landing page and offer Open Your Creative Portals to the world! Keep up with my blogging schedule. Write and send monthly Kind Over Matter guest post. Order copies of my first book, for sale at events this summer and fall. I hope your writing week is full of creative inspiration and forward momentum! I’ve been making progress toward my goals this week, although perhaps a bit slower than expected. It’s still summer, and I just had to take that day at the lake, right? Today I added 915 new words to my book on spiritual practice, and I also created and sent out a short 4-question survey that will help me better tailor the chapter on obstacles to regular practice. So far I’ve received 15 responses in less than an hour, so that’s going well! If you’re interested in personal spirituality and would like to take the survey yourself, click here, and many thanks. This afternoon I plan to write a blog post and a book review. BlackLion and I will also be working on the layout for my creative inspiration e-book. The drawings he’s created for it are terrific! Yesterday I ordered copies of my second book, and I still need to order some copies of the first one (they come from separate vendors). I finished reading a writing craft book, 500 Ways to Writer Harder by Chuck Wendig. It was pretty good. He’s quite funny, with a really twisted sense of humor, and I did glean some helpful tips. But the format of the book was distracting. It was a compilation of list-style posts from his blog. I knew that when I bought it, but I still found myself wishing for more in-depth writing on some of the topics. Ah well. I also finished reading a book that I’m reviewing, and it was excellent. It’s Pagan Dreaming: The Magic of Altered Consciousness by Nimue Brown. It comes out next month from Moon Books, which is the publisher of my first book. Now I just need to write up the review and send it off. All in all, progress is being made and fun is being had, so I feel like I’m on track. I wish you progress and fun, too! Today I got started – well, re-started – on a project that I first began a couple of years ago. I’m not sure why I got stuck with it, but I’m certainly feeling the flow of creativity now! My first step was to re-read what I’d written so far, and then I re-worked the introduction and added to it. I added 835 new words today, and I feel like I’m back in the flow of writing. The project is a full-length e-book on creating and maintaining a daily spiritual practice. Last year when we did a survey of our Feline Dreamers subscribers, spiritual practice was the topic that came out at the top of the list. So I feel like our peeps will enjoy it, and that it’s a worthwhile project. It’s something I certainly have a lot of experience with and passion for, and my initial outline is pretty solid. For some reason, I guess I got bored with writing it. But now I’m infusing it with new sparkly energies, and I feel like the writing itself will be all the better for it. That’s my big news for this half of the week. I’ve also been doing some reading that applies to my goals (writer craft stuff, and a book that I’ll be reviewing for one of the blogs I contribute to). I’ve had plenty of good exercise this week, mostly walking and hiking. 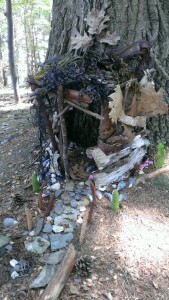 We built an awesome faerie house with a young friend and her Mom on one of our hikes! I’m mostly keeping up with blogging, and I’m enjoying being a ROW80 sponsor. I love reading about what everyone is up to, and how they keep themselves motivated. With BlackLion’s help, finish putting together the Creative Inspiration Booster Pack (including picking a final title). 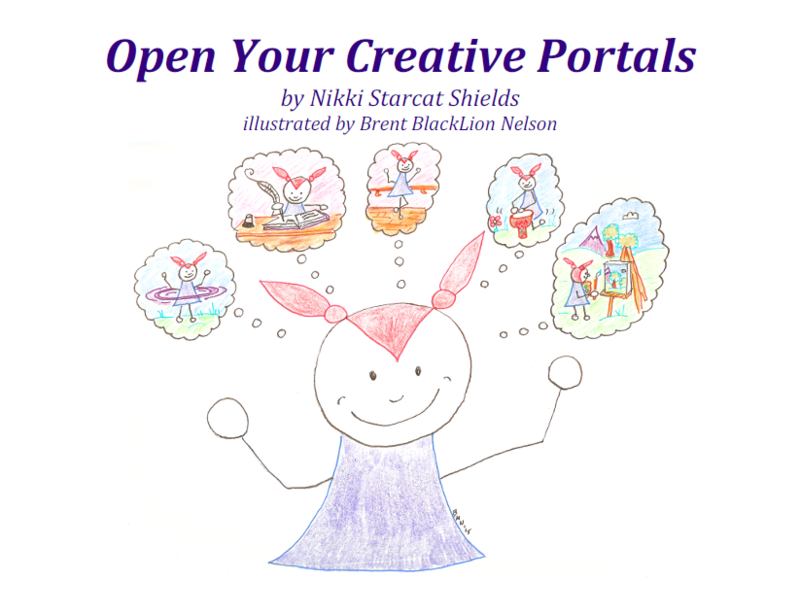 Note: how does Opening Your Creative Portals sound? Finish reading Pagans and Dreaming, then write and send my review. Order copies of my first two books, for sale at events this summer and fall. I wish you a wonderfully joyful and productive week of writerly work! Last week was a quiet week, and I was able to get a lot of writing done. This week has been busier, so I’ve found it challenging to devote bigger chunks of time to my projects. Today was the first day I haven’t been out and about, but I had a bunch of blogging to catch up on, so that’s been taking up my writing energies. I guess I’m still working on finding a good balance. My impulse is to do my larger chunks of writing in the morning, after I get up. If I have to get up and leave the house, I find that I don’t tend to get back to my creative work that day. Perhaps I need to shift my habits around a bit. If I can establish an evening writing habit, even for just an hour or so, that could help on the busier days. I’m going to work on that. BlackLion is creating the artwork for my Creative Inspiration Booster Pack (working title). It looks terrific! We came up with a list of potential drawings based on the text, and he’s working from that. I finished and sent off my (first ever!) ROW 80 sponsor post today. I hope folks find it inspiring. I’ve been mostly keeping up with my blogging plan. I got a bit behind, but it was pretty easy to catch up. I’m excited to dive into my next project, which is the book on daily spiritual practice. I have some ideas for freshening up the introduction and making it more fun. I’ll also be updating the outline. My amateur nature photography has been going really well. 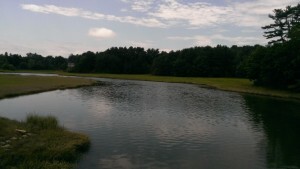 I have lots of photos from my recent trips, and a hike we did yesterday, to use on my blogs. So, things are progressing well, and I’ll continue to work on creating a flexible writing routine that works best for me. Have a wonderful rest of the week! 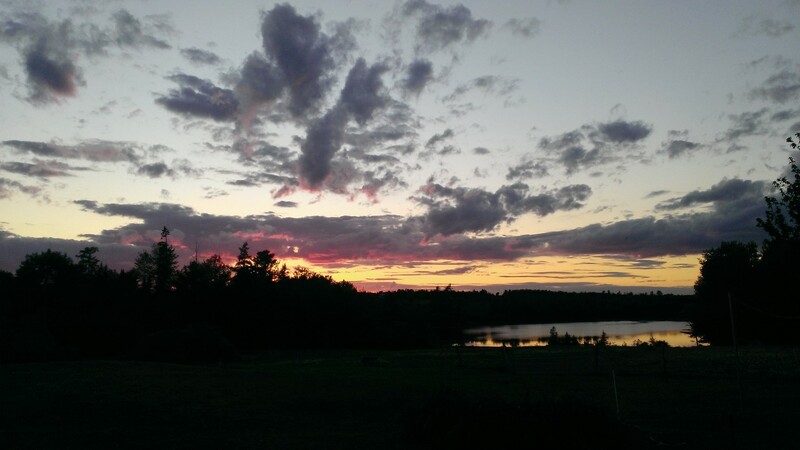 This week I enjoyed the somewhat slower-paced summer life at home. That means I had lots of time for writing, and I have already completed a key component of one of my goals. I finished the first draft of my Creative Inspiration Booster Pack! It’s an e-book that I’m going to use as a gift for those who sign up for my new mailing list over at Starcat’s Corner. I need to come up with a better name for it; “booster pack” implies it includes cards or something. I’m pleased with how it came out, though. I made up seven cool games for it, for folks to use to inspire their creative mojo. BlackLion is going to create some artwork for it, and we’ll pretty it all up. I hope that it will be ready by the end of this coming week, or so. I’m so excited! I’ve been kicking around the idea of giving it to a couple of folks to read and give me feedback. It’s only about 30 pages, so it won’t take too long to read. If you’re interested in boosting your creative powers, let me know and I’ll send it to you. That was my biggest piece of news. Other than that, I’ve been continuing with blogging, journal writing, and meditation. My exercise this week has been walking and swimming (a lot). We also went and picked strawberries, which was fun; they make a delicious snack and yummy smoothies. We made a big double batch of salsa and shared it with some family and friends. I hope your week goes smoothly and productively, with lots of fun and laughter. to focused work on a creative writing project. By writing project, I mean something bigger than a journal entry or blog post. So for my list of goals, this includes work on either of the novels I’m revising, the Creative Inspiration Booster Pack (CIBP), or my non-fiction book on daily spiritual practice. Yesterday and today I started this new habit, working on the CIBP both days for more than an hour. It’s coming along well. I sent what I have so far to BlackLion so he can start thinking about the illustrations he’s going to create. In other updates, I’ve been thinking about the daily spiritual practice book again, and brainstormed some ideas for a compelling title. I took time yesterday to plan out my upcoming blog posts, attaching dates and topics to them. I started working on one for Starcat’s Corner, to be completed today or tomorrow. I want to ramp back up to doing two posts per week on Starcat’s Corner now that I’m back in my writing routine; I’ve only been doing one per week lately because of all my summer travel. I’ve been keeping up with the first week of ROW 80 sponsor visits easily, and I find it fun to read what others are up to and leave my feedback. I did some of that before, but it helps to have it as a responsibility, as it ensures that I get to it on a regular basis. What a cool community we’re a part of! I feel like I’m making good shifts in terms of healthy eating and moving my body, too. All the activity on the road trips has certainly helped, and I hope to keep the momentum going even while I’m sticking closer to home for a while. Swimming has been my go-to activity this week. Have a terrific week of writing and creating, everyone! 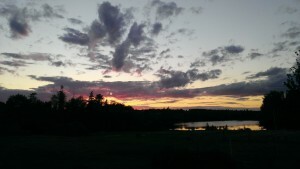 Sunset over the pond at the retreat I attended last weekend. So gorgeous! We’re moving into round 3 of ROW 80, and I’m having SO much fun enjoying the blessed summer. I love it here in New England. I enjoy having 4 distinct seasons, and seeing the progression of the year. Even so, summer and fall are my very favorites. I’ve been doing a lot of traveling around the area, enjoying my road trips. I’ve been camping, drumming, dreaming, swimming, dancing, playing, enjoying time with family and friends (new and old), reading, journaling, meditating, doing yoga, and various other fun things. Plus the chores and tasks that come along with life, which I also enjoy. I’m rather inspired to jump into this round and add my work on bigger writing projects back into my daily life. I’m in a mode of my life where I just feel really good, and the more I embrace it and feel thankful for it and focus on it, the better I feel. I love the upward spiral of positive vibes. Okay, enough hippie joy for now, here are my goals for round 3! Note: if this seems like a ton of goals for one round, that’s because it’s helpful to me to have lots of projects to choose from. I may not get to them all this round, but I want to hold them all as possibilities, then see where creative inspiration takes me! Complete current nonfiction WIP. Update outline for Daily Spiritual Practice (DSP) book to include the new ideas and direction I’ve been contemplating. Revise what I’ve written thus far. Finish first draft of DSP. Target is 5oK words or so. Starting the round, I’m at 8500 words. Finish Creative Inspiration Booster Pack and start building the new e-mail list for Starcat’s Corner website. Add my author name domain to my website(s). Create weekday Fae Musings e-mails for our Feline Dreamers subscribers. Add new folks to the mailing list. Do my ROW 80 sponsor duties. Write an inspiring article to share. Visit my peeps each week and leave comments. De-clutter and organize my life, creating beautiful spaces. Clean and organize my upstairs desk and filing cabinets. Continue to de-clutter and beautify our shared living spaces. Paint the living room, kitchen, and stairwell. Focus on blogging. Post to my Starcat’s Corner blog at least twice per week, Feline Dreamers every other week, and on this blog twice per week. Write ROW 80 guest post to inspire fellow authors (and be a good sponsor!). Write, edit, and submit guest blog posts for Kind Over Matter, Facing North, and Moon Books. Start and keep a running list of blog post ideas, drafts, and picture ideas. Continue my craft & business learning. Read at least 3 books about writing and/or ethical marketing & promotion. Check out a couple of writer podcasts. Keep notes on ideas to use, and begin implementing them. Add a Call to Action (CTA) to my Cultivating Self-Love e-book. GRACEfully invite ease, purpose, and kindness into my daily life. Do things I love: write in my journal, read, do yoga, dance, spend time with loved ones, and express my gratitude. Eat well and exercise. Get outdoors for walking, hiking, and swimming on a regular basis.